Beautiful! I love that iron colour and agree it looks more grown up, the clover was a great choice for the binding too! p.s. do you know you have the dreaded word verification turned on? This is so pretty, I love all the colors, and you are right about the Kona Ice Frappe. Just so easy on the eyes! Great job with the colours, Kelly! A beautiful fresh quilt! Thanks for linking up to TGIFF! 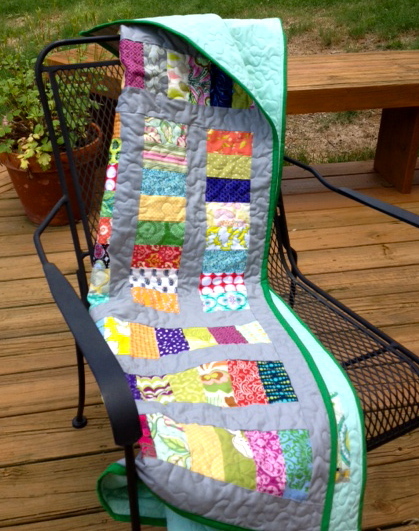 Great quilt, the Kona Iron was the perfect choice and I love your name for the quilt too! Love it! The back is adorable, too. Love your quilt. The colors are beautiful. I love this layout for the stacked coins, very clever!! And I really like the sashing and binding choices too. My 'coins' are 2.5 x 5 inches. Would that work with your pattern? I don't know if you realize that you're a no-reply blogger, so I'm answering here and hope you get it! Thank you so much!! I'm so glad you like it. My coins are 2 x 4 finished, which makes a 16 inch row of 8 coins. With the two inch sashing between the coins, that makes a 16 inch block. So, with 2 1/2 inch x 5 inch coins, a row of 8 would be 20 inches long. three of the coin rows would be 15 inches across, and you could do 2 1/2 inch sashing to make it 20 inches the other way as well. So, yes! it would definitely work, it would just make a bigger block. I think it would look great! Thank-you, yes it makes sense to me!!! And thank-you for doing some math for me, that's not my favorite part, lol! Beautiful quilt with great texture from all that FMQ. I love the colors and the name. Thanks for linking up with TGIFF! Love the grey, it makes those coins pop. What a fabulous quilt. Such a fun combination. I love that green binding. Beautiful quilt. Love the color of the fabric you chose for the back. That is a yummy quilt. So bright and cheerful! Congrats on your last day of school! I'm a teacher with 8 days left. Throughout the year I keep repeating to myself, "Summer always comes, summer always comes." I get most of my quilting done then too. So vibrant and cheery! Love it:) And i love the pairing of the Kona Ice Frappe with the Clover binding! Love the finished quilt. The colors are so much fun. Great quilt! Love the grey in it too! Beautiful quilt! And I love the Kona Iron - I'm a big fan of Kona Coal and Kona Ash, my go-to colors for sashing! I'll have to give Iron a try. I think gray is the new white, don't you? Wonderful finish! Love the scrappy feel all those great fabrics give the quilt. The kona iron and Kona ice frappe were brilliant choices. I love the colour combinations! The quilt is brilliant! This is stunning! Where is the pattern from? This quilt is soooo pretty with the gray background. Nice choice! I, too, like that gray color. I think it makes the quilt more usable because it won't show the dirt so much. This looks like a great picnic or lawn quilt that allows the owner to play on it rather than "keep it for good." Great choice. What a beautiful and happy quilt! I just love all the different Kona you used! Perfect! Enjoy your summer! Your quilt is gorgeous! I have grown to love grey as background too. My DH has his last day of kids today... summertime! Great pattern, love the gray for sashing and green for binding and yes, that backing fabric color is fabulous! thanks for your generous replies to the questions of previous posters too! Very nice! I like the gray sashing! Love, love, love your quilt! Colors, backing, everything. I like how the strings are arranged in blocks. visiting from we did it wednesday. I love this. I love string piecing and the layout looks fantastic. I've never used Iron, but I think I'm going to have to, because it really does frame your coins so well. So pretty!! What a fun quilt. It is a nice take on the coin quilt. I love the gray sashing, too! I need to make a coin quilt soon - yours is lovely! Darling, quilt....definitely grown-up and oh, so pretty! Such a creative stacked coin set up. Well done! I love your quilt! I've made one quite similar but with cream sashing and it's a pain to keep clean with the kids about, what a brilliant idea to use grey, I'm always scared of using coloured sashing! 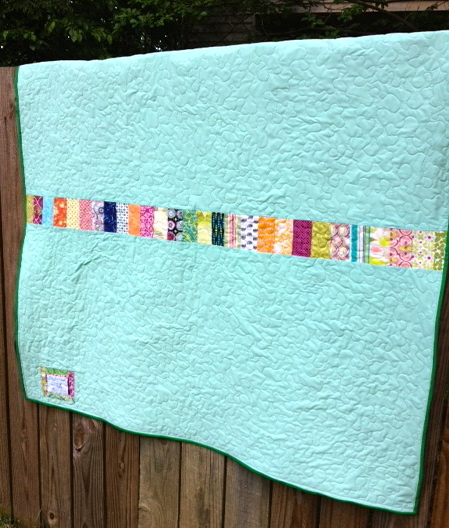 What a beautiful quilt and I love the binding you used! I just finished up one like this too! Thanks for sharing. 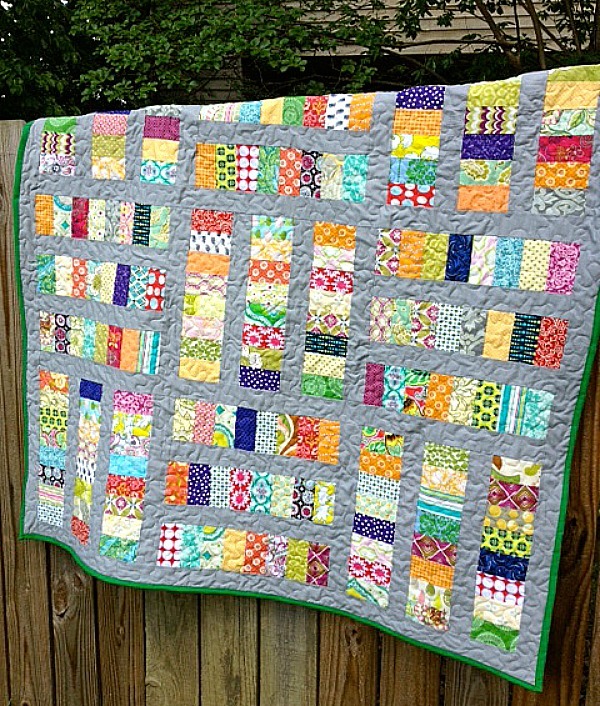 It's a lovely quilt - I agree with you about the backing colour and the scrappy coins! 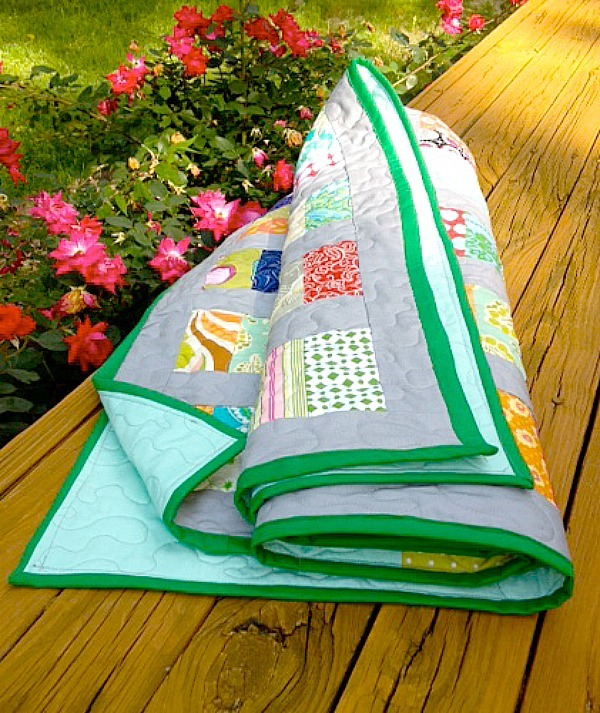 I love everything about this quilt, from the clever name, the bold, bright fabrics in your coins, the grey sashing and the beautiful aqua on the back. You did a great job! Congrats on such a fun finish and thanks for linking up! Perfect job - love the colours and I agree Iron is a great solid! Well done - am sure your family will be impressed! Just like the rest of the quilters I too would like the dimensions of the quilt in a pdf pattern. It is such a charming quilt and I doubt I could duplicate it but I'd sure like to try. I'd love to try it in Christmas prints. I have tons of scraps that I could incorporate. Won't you please share your pattern?